UPDATE: This home SOLD in May 2013. Welcome to this updated Nantucket style garage town home in the heart of Ashburn VA. We hoped that this video brochure will give you a good idea of what the homeowners have done over the past few years to make their home more livable, inviting and to bring the outdoors inside. 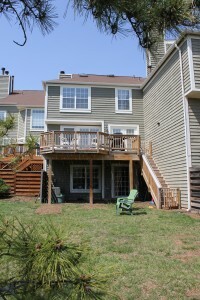 The rear deck was rebuilt a few years ago and it is perfect for an evening grilling and sitting with friends outside! If you are interested in taking a look at my “working pics” then you can see them here on Google Plus. There are over 100 photos and some are duplicates… and I will be adding more. This home located in Ashburn Farm. Read more about the three pools in Ashburn Farm and this exciting planned community.